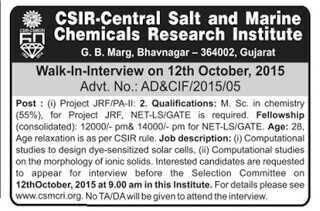 CSIR – Central Salt & Marine Chemicals Research Institute (CSMCRI), Bhavnagar issued a walk in interview notification for recruitment of various Posts . All necessary information like interview date and timings, eligibility criteria, age limit, educational qualifications, how to apply etc are listed below. Educational Qualification:M.Sc. in Chemistry (55%), for Project JRF, NET-LS/GATE is required. Venue: CSIR-Central Salt and Marine Chemicals Research Institute, Bhavnagar, Gujarat.